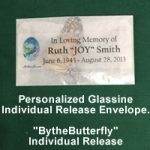 For an Individual Monarch Butterfly release each butterfly is packaged individually in one of our four individual butterfly release options. At an appropriate time, the butterflies are given to those that have been chosen to participate in the release. The release is usually done in unison after the reading of a poem or scripture. All families and all relationships are unique, and some families play music while others have the participants say a little something about their loved one prior to the release. The individual release is exceptionally special for the participants as very few people ever get an opportunity to hold and release a Monarch Butterfly. 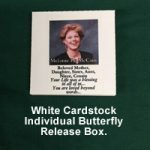 15 Large Monarch Butterflies in Personalized WHITE Square card stock Butterfly Release boxes. After your order is placed respond to your confirmation e-mail with a picture and text. 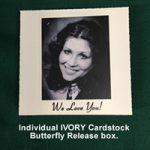 15 Beautiful Monarch Butterflies in Personalized Ivory Square card stock Butterfly Release boxes. After your order is placed respond to your confirmation e-mail with a picture and text. 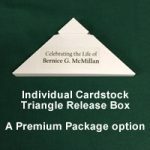 With all the above Individual release packages you may order additional Monarch Butterflies for a cost of $7.75 each. Simply keep shopping, go back to the premium packages page and click on additional butterflies for $7.75. You may add up to 235 additional butterflies. Comparing Monarch Butterflies to Painted Lady butterflies is like comparing a Cadillac to a Kia. 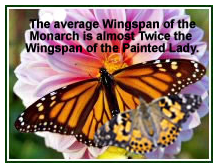 The Monarch has an average wingspan around 4 inches while the Painted Lady averages in around 2”. The Monarch is a Milkweed butterfly, while the Painted Lady can be raised on artificial diet in someone’s garage. We only raise the Majestic Eastern Monarch. Ordering by the butterfly is fast and easy. Just place the order using the “Buy Now/Order” button next to the child holding an individual monarch butterfly. Select a quantity number between 12 – 250 Monarchs. Please your desired text in the comments box on the shipping information page. As always make sure to work your way all the way to and select the “send order” button. 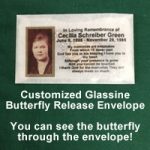 Our personalized butterfly release envelopes include three lines of text. This option is very popular and very affordable. Available as an option in our “bythebutterfly” pricing with a with a minimum order of 12 this is our least expensive choice.